The picture above is from Colin Shields’s book ‘Whatever the Weather’ – the official history of the Scottish Cross Country Union. 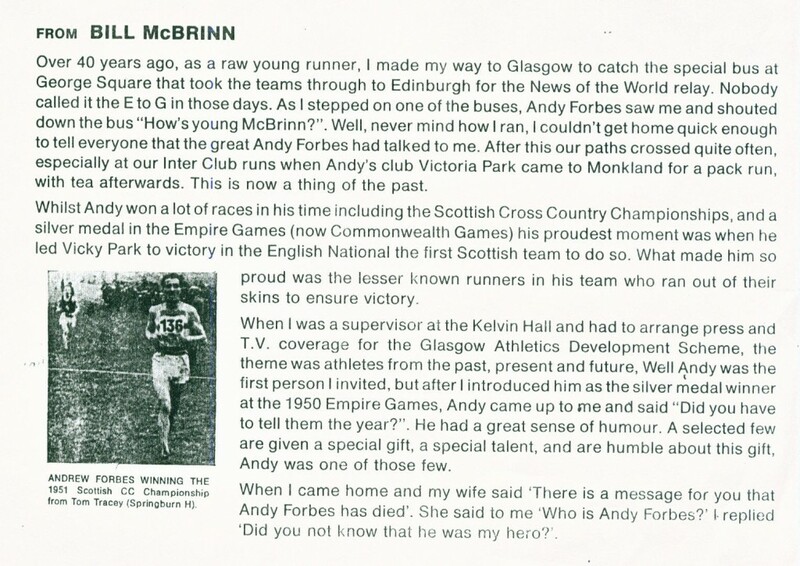 I had just been elected Secretary of Clydesdale Harriers in 1959 and when the discussion in Committee about who to invite to the Presentation Dinner as guest of the club came up, someone said “Andy Forbes.” And that was it – no further discussion when the usual form was to have two or three names discussed before one was settled on. Given the rivalry with Victoria Park, the fact that this staunch Vicky Parker was invited nem con was remarkable but a measure of the respect that he was accorded throughout Scottish athletics. He was Scottish champion over the country and on the track, a multiple record holder and Commonwealth Games medallist. What more could you want? As an introduction to his career we have George Barber’s portrait of Andy published in the ‘Scots Athlete’ of February, 1952. During an inter-club I had a good chat with Andrew Forbes, the present cross-country champion and three miles champion and record holder. Andy – I must say now – is a very modest man and it was with the greatest difficulty that I got him to say anything about himself. He first started running in 1935 with Victoria Park, and fancied shorter events when they took him across country and during the following years ran unobtrusively winning a few track handicap races. Then came the war and in the Services he did little or nothing in the competitive side until 1944-45 when he won the BAOR (British Army on the Rhine) 1500 metres championship in 4 mins 10 secs. His reaction to his services days was interesting. He thought that the open air life, the regular meals and the training really did him good. He mentioned the many opportunities he had of using tracks which did not exist outside the services and it was an illuminating thought that with so many of our boys having to do their National Service training that they may improve instead of otherwise. On his return to civilian life Andy took to the country and was the Midland District CC Champion 1946-47 and also the Scottish National CC Champion – Junior and Senior the same year. In 1947 he won the Scottish 3 miles championship and in the following triangular match finished a very close second to Alec Olney (England) in the 3 miles creating a new native record of 14 minutes 32 seconds at New Meadowbank. In 1948 an unfortunate foot injury interrupted and spoiled his chances of Olympic selection but as the Scottish 3 mile champion, he ran second at Manchester in the triangular match in the 5000 metres when he and Alec Olney again raced for it and Andy was beaten by 12 yards in 14 mins 48.4 secs finishing ahead of two of the newly selected Olympic team runners. The same year he ran for Great Britain v Denmark at Copenhagen. 1 Mile: 4 mins 19 secs; 2 Miles: 9 mins 14 secs; 3 miles: 14 mins 15 secs and 6 miles: 30:31 9/10th. Quite an impressive total. He won International honours over the country in 1947-49-50 and 51 and was the first Scot home in 1949 and 1950. We had quite a long talk about his likes and dislikes of diet but Andy has no dislikes and can take any kind of food. He likes to drink glucose before a race but is not quite sure whether it is not just psychological in its effect or not. He trains hard and often, does not mind training on the road because he has a light step, but does not like running alone during training. Andy feels that company is desirable and is certain that cross-country RUNNING is excellent training for strenuous track work despite what the AAA officials say to the contrary. 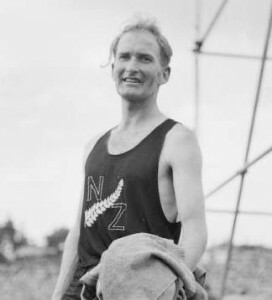 His proof is that after a hard continuous cross-country season in 1949-50, he ran so well in New Zealand. We discussed whether there are too many races during the winter season and he agreed that even a minor event could take as much out of you as a major one and that no matter how you feel before a race, the actual race had to be started before you knew exactly your condition. So many factors come into it. The wind, conditions underfoot, reckless running of men with no chance in the actual race so that as well as the physical trials during the race, there is certainly a mental stress that draws from the reserves. Andy has always listened to what older runners have had to say and studied carefully any information regarding previous races. During a race he likes his time to be given to him as a check against himself and the others in the race. Andy is now aged 35 and has a strenuous job as a Commercial Traveller, out in all weathers which suite him. He feels at the moment he is at his best, he weighs about 9 st 8 lbs and likes to have a bit in hand to shed when he wishes. He is looking forward after this full cross-country season to the following track season with an eye on Olympic honours at Helsinki. The SAAA championship race the following year was another in which he finished second by only two tenths of a second – this time to John Joe Barry from Ireland. His time of 14:18.4 was nevertheless another Native record. Later that year he competed for Great Britain for the first time in a match against France in London. Forbes’s young club mate Hugh Barrow sent the following three pictures of Andy in action during the race. Andy can be easily picked out by his erect running action with the high knee lift – in the third photograph he is running fourth. He went on to win the SAAA Three Miles again in 1951 and 1952 in 18:28.8 and 14:26.9. I have separated the track running from the cross-country and road racing aspect of Andy’s career because, while the track running was entirely his own the team aspect of his winter seasons are as much a part of the Andy Forbes story – hence the team picture at the top of this section. A very good clubman, Andy ran in many races for his club and helped the win many medals. If we look only at his performances in the Edinburgh to Glasgow Relay and the National Cross-Country Championship, we get this table. 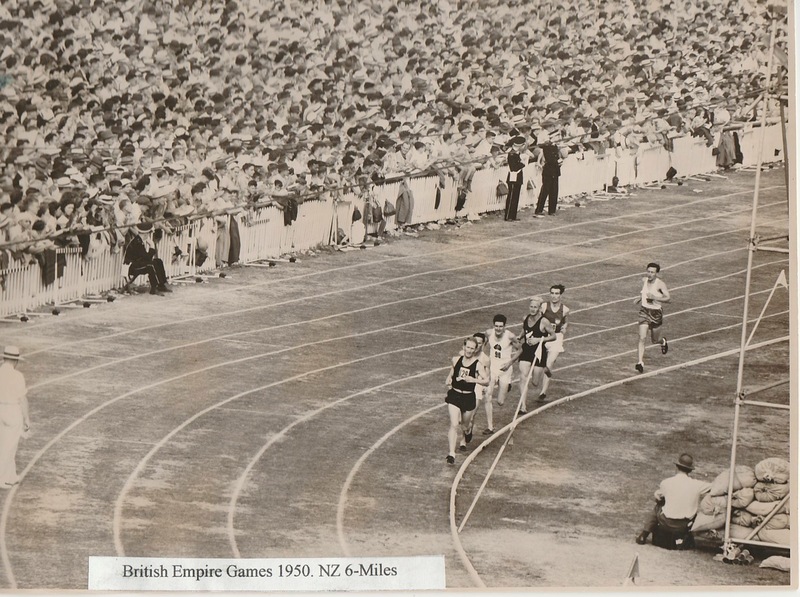 It is well known that Victoria Park in the 1950’s was virtually invincible on the road and almost as good over the country, nevertheless Andy’s performances in the Edinburgh ot Glasgow are really remarkable: eight runs, five fastest times, two second fastest times and no details available yet for the eighth! 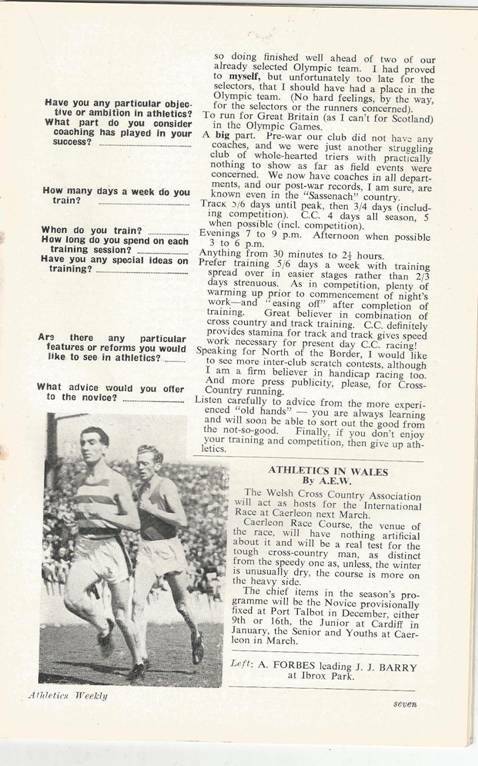 As for the National, the star in 1948 indicates that although he was fit enough to run he had been training over short distances very fast as one of the pool of ‘Olympic possibles’ selected by the AAA’s: he was as ‘The Scots Athlete’ says “an interested spectator! The picture below is of Andy passing the baton to Alex Breckenridge in the Edinburgh to Glasgow. Andy started 1948 by winning the Nigel Barge Road Race at Maryhill from a good class field but with the Olympics to be held later in the year was a non starter in the National so 1948/49 was his first complete winter for two years. 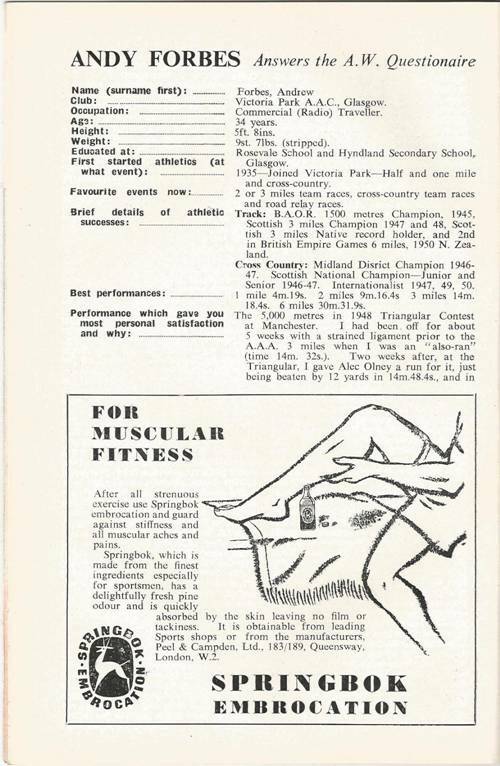 The December issue of ‘The Scots Athlete’ reported on ‘Mr Mercury’: “Andy Forbes, thwarted by being unable to show his paces in the Whiteinch relay owing to the unfortunate breakdown of his club’s first man, adopted the role of ‘Mr Mercury’ in the Kingsway Relay and thus duplicated Fleming’s feat of the previous fortnight. Taking over in fifth place he made a characteristic last lap effort to pass all his opponents and win by a margin of some 8 secs. His time of 13 mins 56 secs is only a few seconds hort of his last year’s record effort.” He had fastest time in the Midland Relay and was a hot tip for the International when the National Championships were due with Emmet Farrell forecasting a duel between Andy and John Joe Barry for the title. The race was held at Ayr and the report read: “Just as in the Grand National for horses, the jump known as Becher’s Brook has been the death of many a favourite’s hope – so at Ayr the stream encountered id-way round each lap ruined the chances of many well-known runners including the favourite Andrew Forbes. Swollen and in spate and with both banks a sea of mud from which no correct take-off could be had, this natural hazard meant immersion each time and appeared to have a particularly adverse effect on some runners.” James Fleming of Motherwell YMCA coped best with the conditions and Andy was eleventh. He was selected for the International only by vote of the Committee because of his known class. It was held in Ireland, and was first Scot home when he was fifteenth. 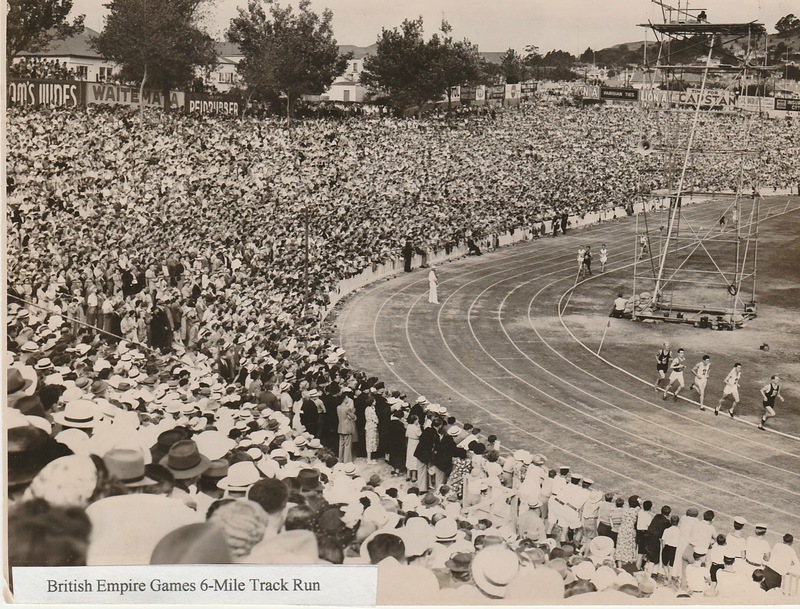 There was great excitement in 1949 at the return of the Edinburgh to Glasgow eight stage relay. 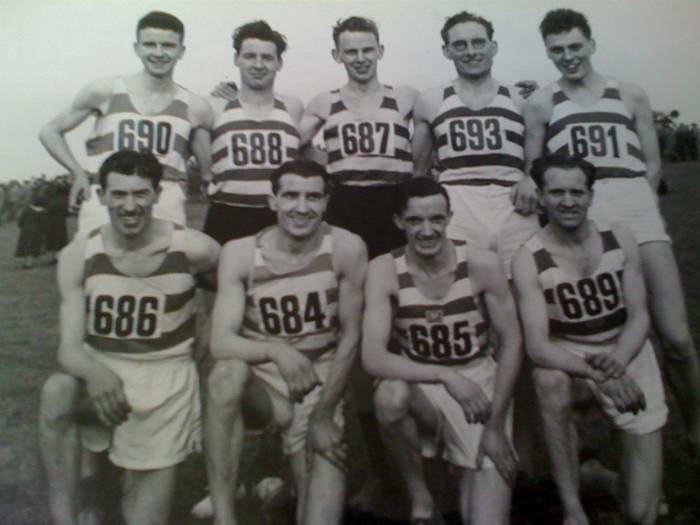 The first post-war race was held in April and won by Shettleston Harriers from Victoria Park. Andy ran the fourth stage and lifted his club from third to second with the fastest time of the day, 64 seconds quicker than the nearest time. Later in the year it settled into what would become its regular slot in November and the headlines told that Shettleston won again ‘despite a great bid by Victoria Park.’ The Forbes brothers had a lot to do with that – Chic Forbes ‘considerably whittled down Shettleston’s lead on the fifth fifth leg and his more famous brother Andrew stormed into the lead on the long sixth stage.’. Chic was fastest on his stage by 58 seconds and Andy quickest on the sixth by 59 seconds. Shettleston also won the District Relays but Andy again had the fastest time. In the National Cross Country Championships in March, Shettleston were the winning team with Victoria Park third. Andy in eighth led the team home and selected this time on his placing, Andy was twenty ninth and again first Scot to finish. In 1951-52 the club again won everything there was to win with the sole exception of the Midlands District Championships and Andy continued his battle with Tom Tracey. They won the McAndrew Relay at the start of October and were only third in the District Relay before tackling the E-G. They led from the first stage to the last with Andy having second fastest time on the long sixth stage, eleven seconds behind Eddie Bannon of Shettleston. On New Year’s Day he was second to Bannon in the Beith Cross-Country race and on the Saturday, Andy again won the 5 miles Nigel Barge race – this time from team-mate Ian Binnie with Tracey third and Victoria Park won the team race. Came February and Andy was third in the Midland Championship and the team was second to Shettleston again. In the 1952 National Forbes was third and Victoria Park again won the title. Not content with the Scottish title, the travelled to England for the British Cross Country Championship and came home victorious. Runners are in the picture above -Andy Forbes was 11th, Jimmy Ellis 32nd and Ian Binnie 41st before the ‘pack of three’ came in – Chic Forbes 51st, Ronnie Kane 52nd and Johnny Stirling 54th. This was followed by third place in the London to Brighton Relay Race – their best ever performance. 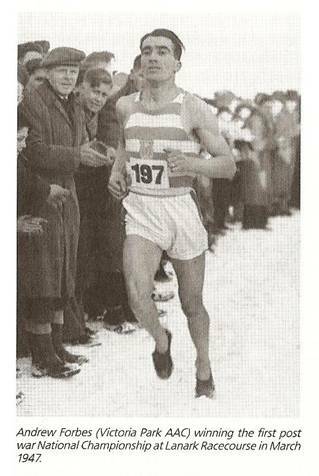 In the international Cross Country Championships he was first Scot home in 52nd place. Before the National Championships, Emmet Farrell had indicated that Andy was having problems with a foot injury and this might have contributed to him missing the McAndrews at the start of 1952-53. 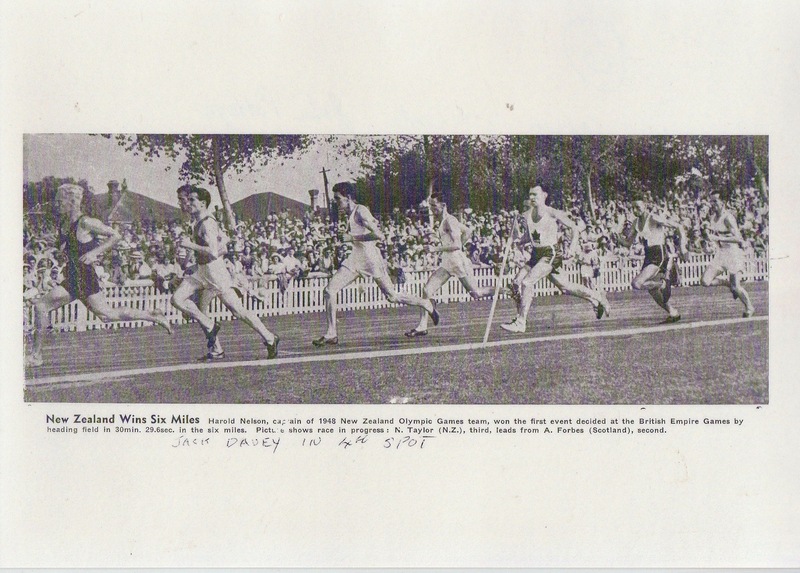 In the Midland Relays Shettleston won from Victoria Park for whom Andy was slowest man in a team of Chic Forbes, Ronnie Kane, Bob Calderwood and himself. After the first lap when Bobby Calderwood was second to Clydesdale’s George White, Victoria Park led every stage to the finish with Andy running a record time for ths seventh stage. Emmet Farrell commented, “Andy Forbes showed a welcome return to form by narrowly creating a ne record on the seventh stage displacing Donald Urquhart, Garscube’s ex-internationalist.” The question was also raises whether they could win the London to Brighton and it was felt that they had an excellent chance. 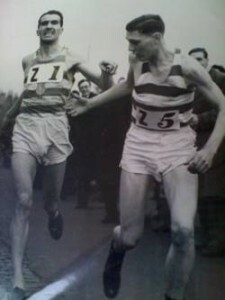 In the Midland District Championships in January, 1953, Andy was seventh, second VP member behind Breckenridge in second, and the team was first. He had a better run in the National where he was second forty seven seconds behind Bannon to lead Victoria Park to team success yet again. He had another very good run in the International where he was twelfth (one place behind Jim Peters and eight behind Bannon, nevertheless after praising Bannon’s fourth place, Emmet Farrell had this to say: under the headline, “Forbes Answers His Critics”: ‘Andrew Forbes twelfth place was a magnificent one, in a comparative sense very little behind Bannon’s effort considering his long service and his recent numerous hard races for his club. By beating on the day such great runners as Vandewattyne, Coll, Pirie, Ranger, Theys and Holden he answered in unmistakeable fashion the suggestion that he is a fading veteran of other days. On this form Forbes is still at the zenith of his powers – capable indeed of leading his country to an even higher placing in this severe and rigorous athletic test.” In the London Brighton, in what was described as a great contest, the club was seventh. Season 1953-54 had another victory for the club in the Edinburgh to Glasgow Relay after second in the Midlands four man relay. Andy Forbes ran the seventh stage of the E-G where he had second fastest time but retained first place. However, in his annual preview of the National Championships, Emmet Farrell did not include Forbes in his list of contenders for the top places and said: “Andrew Forbes, below par and under doctor’s orders, is not likely to take part in serious competition this season at least. Not only his club but his country will miss his services. One recalls his splendid second to Bannon in last year’s National and his perhaps even greater twelfth in the International in Paris.” And indeed Andy missed the entire ’53-’54 season. The above questionnaire replies were sent to me by John MacKay and they make a valuable addition to the site. 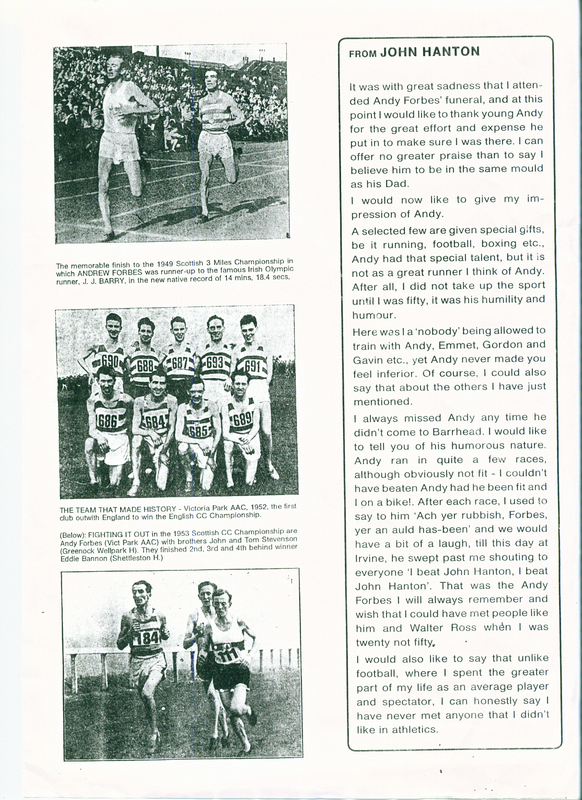 The following season, 1954-55 started with victories for Shettleston in both the McAndrew and District Relays and there was no Andy Forbes in either of them. His club won the E-G in November in a new record time but there was no Andy Forbes on any stage. He missed the Midland Championships and also the National. In fact he missed the National in 1954, ’55 and 56 and did not run in the E-G in 1954, 55, 56 or 57. He made a comeback in the 1957 National when he was thirty sixth and the club’s final counter and won himself a team gold medal. It was clear that, apart from the E-G in 1959 when he was fastest on stage seven in the bronze medal winning team, his best days were behind him in terms of winning titles and gaining international vests. He did not however give up the sport as so many might have done. He not only trained at the club, encouraged, inspired and coached the younger runners but moved effortlessly into a road running career and ran with his friends including Emmet Farrell, David Morrison, and Gordon Porteous – I remember one of my own first road races after demob from National Service (at Dunblane) these four old guys ran effortlessly past, gabbing away pausing only to ask if I was OK, son? – which was running for the sheer pleasure of it. When the vets scene arrived in Scotland, Andy was a veteran who raced and enjoyed it. You could know him at that time, enjoy his company and never know how good he had been. No boasting, no incidental name dropping – he carried on conversations, listened to the other fellow and was a pleasure to know. He was also a direct contrast to his club-mate Ian Binnie: where Binnie was challenging, Forbes was encouraging. the club was lucky to have them both at its disposal. The word ‘gentleman’ is much abused these days and is often applied inappropriately so I seldom use it. In Andy’s case however it is appropriate and the following tribute is from clubmate and equally loyal Victoria Park harrier Hugh Barrow. “Imagine being selected for the Empire (Commonwealth Games) and then finding you needed months off work just to get there and back at a time when employers didn’t co-operate. Well, it’s 1950 and the War was not long ended and Andy was selected for the Empire Games in Auckland , New Zealand, and you had to sail there. Andy’s employers, Phillips, were not amused but in stepped Glasgow business man Sir AB King who offered to pay his airfare along with Alan Paterson, high jumper. Mind you it still took a week to fly there but better than a month sailing. This gesture enabled them both to gain silver medals. Andy, like Sidney Wooderson had his career cut in half by World War 2. He was a stalwart for Victoria Park for so many years – star – club man – coach, it didn’t matter to Andy but always a gentleman. He encouraged so many young athletes, whether it be at Scotstoun Showgrounds, Whiteinch Bath where he had his own stall, or his beloved Milngavie. Each venue had its own atmosphere and I was privileged to be part of that time.